With the passage of the Affordable Health Act, the healthcare industry has changed dramatically: healthcare providers must navigate many new laws and changes to the old ones. Additionally, new means of investigating healthcare fraud combine with new or more strictly enforced penalties for violation, creating an enforcement climate in which everyone must stay on their toes. Now more than ever, health care attorneys need to understand the legal environment and the latest developments. 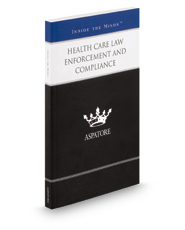 Health Care Law Enforcement and Compliance is a valuable tool that will help you meet this goal, providing expert perspectives on the nuances of the ACA, the best methods of working with various enforcement agencies, and the most effective strategies for setting up and maintaining compliance plans. Top lawyers share their opinions on recent significant cases, such as Kane v. HealthFirst, Inc. and U.S. ex rel. Drakeford v. Tuomey Healthcare System, Inc., and explore how those decisions might shape healthcare law in the future. As the U.S. healthcare system continues its dramatic shifts, attorneys can look to this book for guidance.